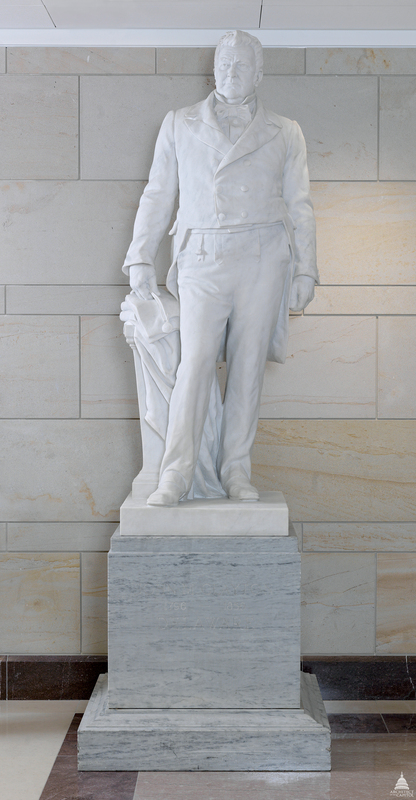 This statue of John Middleton Clayton was given to the National Statuary Hall Collection by Delaware in 1934. John Middleton Clayton was born into a distinguished Delaware family on July 24, 1796. His father, a farmer by occupation, was also a student of the classics, a taste inherited by his son. John Clayton entered Yale college on his 15th birthday and graduated with the highest honors in his class. He was admitted to the bar in 1819 at the age of 23 and in 1824 he was elected to the Delaware legislature. In 1829, Clayton was elected to the U.S. Senate, its youngest member at an illustrious time in the Senate's history. A member of the Whig Party, Clayton was a strong ally of Henry Clay. He was known for his oratory and his abhorrence of corruption; his investigation of the Post Office Department led to its reorganization. Clayton favored the extension of the charter for the United States Bank. When President Jackson removed federal funds from the bank, Clayton voted with the majority of the Senate to censure the Chief Executive. Clayton resigned his Senate seat in 1836. He soon accepted the appointment as chief justice of the Delaware Supreme Court, but he resigned in 1839 to support the presidential candidacy of William Henry Harrison. He served again in the U.S. Senate from 1845 to 1849. As President Zachary Taylor's secretary of state in 1850, he negotiated the Clayton-Bulwer Treaty with Great Britain, laying the groundwork for America's eventual building of the Panama Canal. John Clayton died on November 9, 1856.